In the vascular endothelium, mechanical cell stiffness (К) and nitric oxide (NO) release are tightly coupled. “Soft” cells release more NO compared to “stiff” cells. Currently, however, it is not known whether NO itself is the primary factor that softens the cells or whether NO release is the result of cell softening. To address this question, a hybrid fluorescence/atomic force microscope was used in order to measure changes in К and NO release simultaneously in living vascular endothelial cells. Aldosterone was applied to soften the cells transiently and to trigger NO release. NO synthesis was then either blocked or stimulated and, simultaneously, К was measured. Cell indentation experiments were performed to evaluate К, while NO release was measured either by an intracellular NO-dependent fluorescence indicator (DAF-FM/DA) or by NO-selective electrodes located close to the cell surface. After the application of aldosterone, К decreases, within 10 min, to 80.5 ± 1.7% of control (100%). 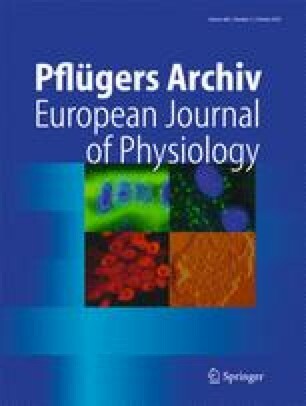 DAF-FM fluorescence intensity increases simultaneously to 132.9 ± 2.2%, which indicates a significant increase in the activity of endothelial NO synthase (eNOS). Inhibition of eNOS (by N ω-nitro-l-arginine methyl ester) blocks the NO release, but does not affect the aldosterone-induced changes in К. Application of an eNOS-independent NO donor (NONOate/AM) raises intracellular NO concentration, but, again, does not affect К. Data analysis indicates that a decrease of К by about 10% is sufficient to induce a significant increase of eNOS activity. In conclusion, these nanomechanic properties of endothelial cells in vascular endothelium determine NO release, and not vice versa. Work was supported by the graduate program “Cell Dynamics and Disease,” University of Münster (international PhD scholarship to first author) and by grants from the Deutsche Forschungsgemeinschaft (OB 63/17-1 and Koselleck Grant OB 63/18). We thank Prof. Hugh E. de Wardener, Imperial College, London, for critically reading the manuscript. This study was conducted complying current laws and ethical standards.